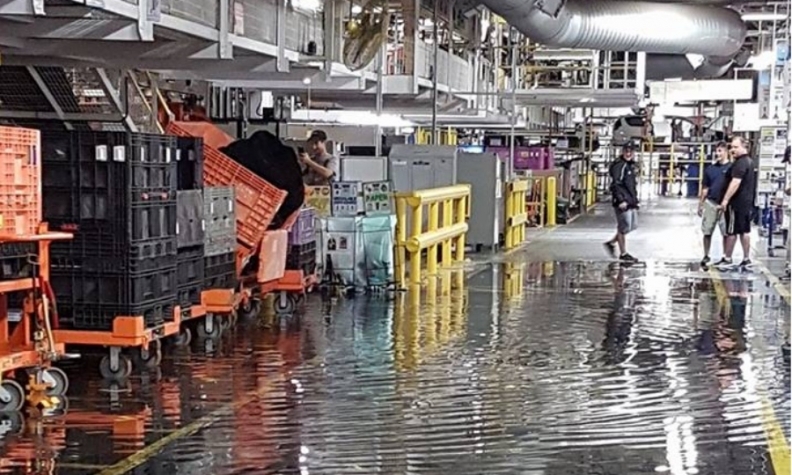 A photo posted to the Windsor/Detroit Revitalization Networks Facebook shows flooding inside FCA's Windsor Assembly Plant. Editor's note: An earlier version of this report incorrectly stated the start time at Windsor Assembly Plant. Most areas of the plant start at 11:36 p.m.
Full production at Fiat Chrysler Automobiles Canada’s Windsor Assembly Plant in Windsor, Ont., resumed early Wednesday, after flooding from two days of heavy rain halted the assembly of minivans there late Tuesday. As water began to stream into the plant, the automaker sent about 2,000 hourly employees home at 5:30 p.m. ET. Both a spokesman for Unifor, which represents hourly employees at the factory, and FCA Canada spokeswoman LouAnn Gosselin said full production resumed sometime on the midnight shift. Neither could provide more details. The rain began Monday evening and the plant and surrounding roads began flooding late in the afternoon Tuesday. Cars were left stranded and underwater on Walker Road, just metres from the plant’s main employee entrance. Facebook users posted photos of rising water on the factory floor. The Windsor Police Service also closed the city’s main freeway, the E.C. Row Expressway. Rain has been falling in Windsor and the surrounding Essex County region for nearly two days. About 58 mm of rain fell Monday in Windsor, according to Environment Canada. An additional 80 to 150 mm fell in the city between 9:30 a.m. and 3:30 p.m. Tuesday, with total amounts varying by location. Another 50 mm of rain were expected as part of a severe thunderstorm forecast for Tuesday evening. Environment Canada forecast sunny skies for Wednesday morning but there is a 30 per cent chance of more showers and a risk of a thunderstorm in the afternoon. FCA Canada spokeswoman LouAnn Gosselin had few details about the decision to stop production or which areas of the sprawling factory that covers 4.4 million square feet were most affected. She said employees on the midnight shift, which began in most areas of the plant at 11:36 p.m. Wednesday, reported as scheduled. Plant officials reassessed the situation then and production resumed at some point during that shift. She couldn’t provide any additional information. The 2017 Chrysler Pacifica, Chrysler Pacifica Hybrid and Dodge Grand Caravan are assembled during three daily shifts at the 89-year-old factory. The plant, which now employs nearly 6,000 people, began building minivans in 1983. It’s the automaker’s only plant that produces minivans and churns out about 1,400 vehicles a day.